Shoemaker Macbeth and 80’s throwback band Devo have joined forces to “whip” up one of the coolest vegan shoe lines of the summer. The launch of the eye-popping, animal-free footwear dovetails with the release of Devo’s comeback album, Something for Everybody; its new digital EP, “What We Do;” and the band’s upcoming North American tour. Available for pre-order, the unisex shoe consists of 3M’s reflective uppers and fluorescent outsoles. Devo-lutionaries will also receive a free, exclusive download of “Don’t Shoot (Polysics remix)” when they purchase from the DEVO store. 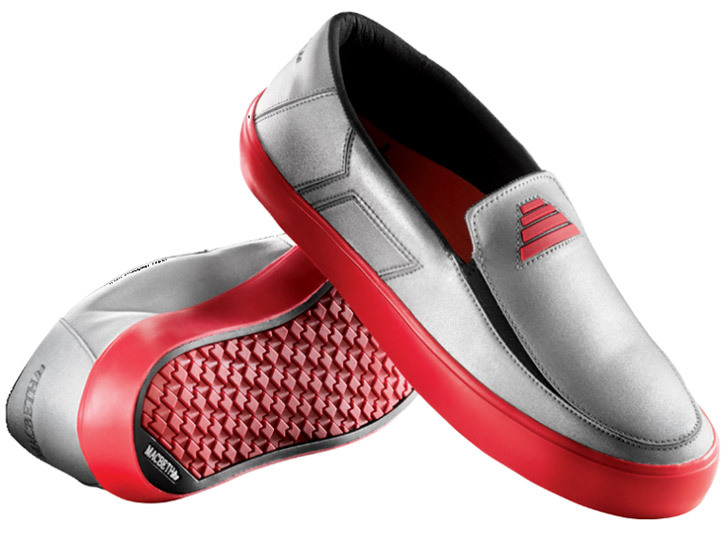 The slip-on shoe comes in highlighter red or blue, and features Devo’s signature “energy dome” logo on the front. 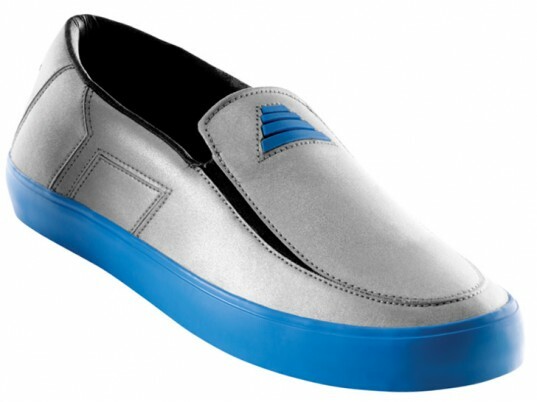 Created with the ultimate fan in mind, the shoe is a dead ringer for the ones band members wear on stage. So whether you’re jonesing for a blast to the past or a conspicuous way to show your Devo-tion, you better act fast: Only 250 were made. What exactly do you mean by "throwback", young man? Also, get offa my lawn! Shoemaker Macbeth and 80's throwback band Devo have joined forces to "whip" up one of the coolest vegan shoe lines of the summer. The launch of the eye-popping, animal-free footwear dovetails with the release of Devo's comeback album, Something for Everybody; its new digital EP, "What We Do;" and the band's upcoming North American tour. Available for pre-order, the unisex shoe consists of 3M's reflective uppers and fluorescent outsoles. Devo-lutionaries will also receive a free, exclusive download of "Don't Shoot (Polysics remix)" when they purchase from the DEVO store.